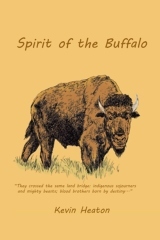 “Spirit of the Buffalo” is a foray into the past. The pulse of bold spirits. The legacy of two proud cultures whose resolves were often tested, but never broken. An adventure across a bold bellicose land, beautiful and resilient; fraught with perils and confrontations. The melding of man to beast, and of obverse sides into one coin. The travails of a nation proudly sired, and not since equaled. Kevin Heaton writes with passion from his love for a land, its people, their obsessions- his, and from a gallery of memories. In addition to Spirit of the Buffalo his chapbooks include, Measured Days (Heavy Hands Ink Press, 2010), Breaking Ground (MLM Press, 2011), Chronicles (Finishing Line Press, 2012), and Family’s Family (Aldrich Publishing, 2013). His poems have appeared in Beloit Poetry Journal, Guernica, Raleigh Review, Beecher’s Magazine, Crannóg, and many other fine publications. Three times nominated for the Pushcart Prize, he has also received nominations for Best of the Net, and Best New Poets 2013. You can find more information and additional books by Kevin at http://kevinheatonpoetry.webstarts.com/.